Pransellknit » Blog Archive » Claudia, or Claudius? Thanks everyone for your lovely comments about the Tyrolean Cardigan. 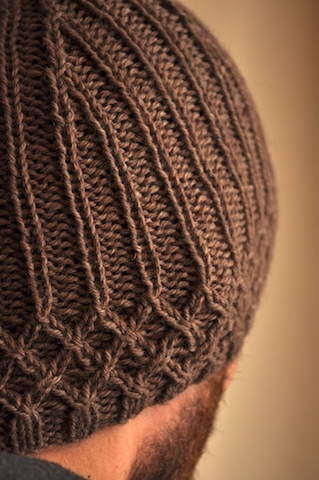 Vintage and vintage-esque knits is really the direction I’ve been wanting to go down for quite some time and it’s lovely to get some affirmation that it was a good move (for this project anyway). Ultimately it’s been myself, and myself only, that’s prevented me knitting the things I really want to knit and wear. In a classic case of not seeing the forest for the trees, it’s been short term things, such as being put off by the fine gauge or the extra effort required for yarn substitutions, that had been my focus, rather than knowing that I’ll be creating a garment that I will enjoy and wear a lot. It’s funny how there’s such a difference between the projects you would like to work on and the projects you would actually use, once all those hours of labour (and love) have gone in. Despite its feminine name, I think Claudia makes for a good unisex beanie. The only modifications came about by pure accident; I crossed the wrong way on the first row of trellis stitch, so the other crosses have also been reversed, and the post-trellis stitch ribbing was meant to be knit through the back of the stitch. It was a little while before these mistakes were realised, but the recipient doesn’t seem to mind, and I don’t mind, so we’re all good as far as I’m concerned. Something that bothers me a little is that it’s currently unblocked, and I think the ribbing would settle a little if it was. Given it’s current amount of use, I might have to wait until after winter before I can block it. The next couple of weeks are going to be fairly busy in the Pransell household, as we are planning an interstate move in about a week and a half. While I’ll be at home during this time, I’m not sure if I’ll be able to post much more before we head off. The intention to post a little more frequently is there, but how this reconciles with reality is an entirely different matter. Oh yes, I could see my husband requesting one of these. Good luck with the move. Ooh. I like. I think this looks niceer than Koolhaas! Very unisex. Good luck with your packing! I’m going to really miss you, you know!